The Japanese Friendship Garden of San Diego’s summer day camp is including go lessons, for the second year in a row. Using equipment provided by the American Go Foundation, San Diego Go Club president Ted Terpstra reports that he’s “teaching beginners the basics of go, and having them playing games on small boards within 20 minutes.” Fifteen day campers are learning about go through Hikaru no Go episodes on Hulu, as well as with books. “The enthusiastic go players have sets available during free time for playing after learning the essentials,” Terpstra adds. Each week is a different age grouping with children in grades from kindergarten through 6th, the program is running for five weeks. 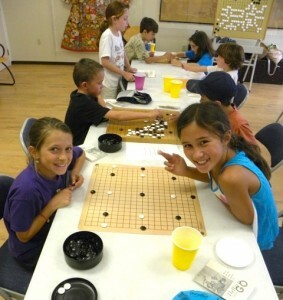 -photo by Ted Terpstra: third and fourth graders learn go.